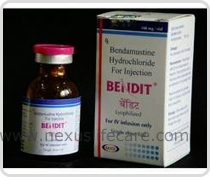 Uses:- Bendit Injection an anti cancer drug is prescribed for the treatment of chronic lymphocytic leukaemia. Bendit Injection is prescribed or the treatment of indolent B-cell non-hodgkin's lymphoma that is drug-resistant to other therapies. Side Effects:-Fever, chills, body aches, flu symptoms, sores in your mouth and throat, easy bruising or bleeding, purple or red pinpoint spots under your skin, unusual weakness, lower back pain, blood in your urine, urinating less than usual or not at all.